The SSM® Series have stainless steel meter bodies, tested and certified to NSF/ANSI 372 for lead-free compliance and meet or exceed AWWA specifications. The SSM® Multi-Jet meter has a long meter life and good tolerance to contaminants. The series is well suited for industrial, commercial and residential applications. The dry sealed registers are easy to read and will retain their clear view display. The SSM® Series meter is available in sizes from 5/8" x 1/2" to 2" with maximum flow rates up to 160 GPM and pressures up to 150psi. Registrations are available in gallons, cubic feet, or liters/cubic meters. The SSM® meter is a totalizing multi-jet meter for those applications that only need to read the totalized flow at the meter. The SSMRS® which is equipped with a reed switch for a dry contact electrical output. Create a customized system specific to your application requirements. * Continuous Flow: The size of meter selected should be based upon continuous flow (gpm), as opposed to pipe size. For example, if it is determined that continuous flow is 25gpm, a 1" meter should be selected rather than a 3/4" meter. ORDERING INFORMATION: Select the meter model number from the Meter Selection Chart above. Add a G for Gallon reading or a C for Cubic Feet reading or an L for Liters reading. Temperature Range: 35°-122°F. Protect the meter from freezing. Accuracy: ±1.5% of maximum flow when operating between minimum and maximum flow range. Flush the line thoroughly after all plumbing changes to prevent contaminates from entering the meter. Install horizontally with the register facing up and inlet port facing the water supply line. For outdoor installation, protect meter from direct exposure to the elements. Protect meter from backflow of water opposite of indicted flow direction. Install a Carlon Slow-Closing Valve downstream of your water meter. This will eliminate possible meter damage from water hammer in your system. 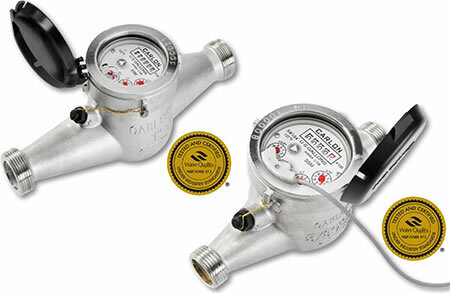 Install a Carlon Strainer upstream of your water meter to protect the meter and any other in-line process equipment from becoming jammed by particulate matter in your system. ISTEC warrants its products to be free of defect in material or workmanship for a period of twelve months from the date of purchase. Contact us to obtain a copy of our complete statement of warranty.